Hello! I am so happy to be able to stamp and share a card with you today. I am using the Field Flowers Silhouette set. I started by sponging the circle using Sweet Stamps' Ink Spots in Montego Bay and In the Pink. I then stamped the flowers onto the sponged background and set it aside to work on the yellow background. I used the Tangrams stencil. I sponged it using Dandelion Ink Spots. I then adhered the flowers onto the stenciled background using 3d tape. I then stamped the sentiment and added some sequins. Be sure to check out our Anything Goes challenge to win some fun prizes. Pretty card! Your touch of sequins, adds just the right splash of bling :) Thanks for sharing at CAS on Sunday! Gorgeous card! 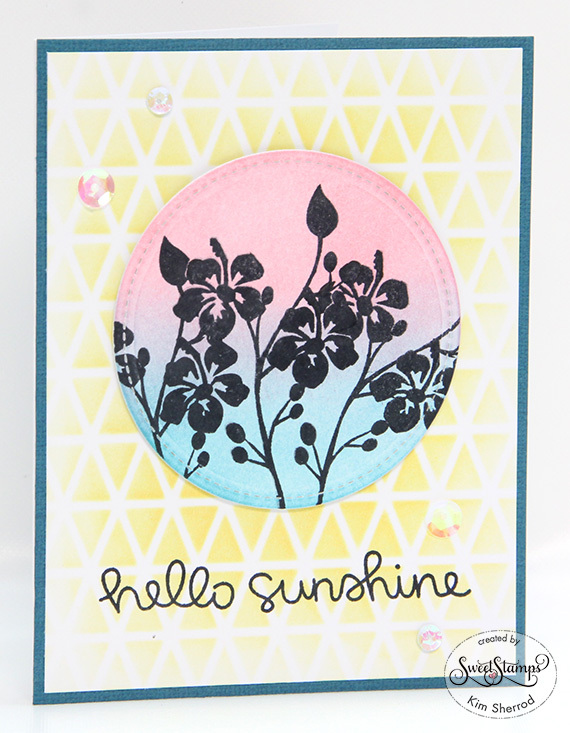 I love the stenciled background against the silhouette! Thank you for joining our Great Impressions Challenge this month, and I hope you to see you next month.